Take control with Jack Black Hair Gel, a lightweight styling gel that delivers long-lasting hold with conditioning properties. With a new and improved formula, the non-sticky product is based on a PureScience® formula, combining organic basil leaf, organic kelp and ginger root to add body and fullness whilst nourishing and adding shine. 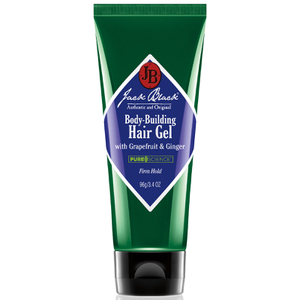 Drying instantly on the hair, the gel will hold your style in place without weighting hair down or leaving unsightly flakes and build-up. - K.N. Free from parabens, fragrance and colorants. Dermatologist tested and cruelty-free. 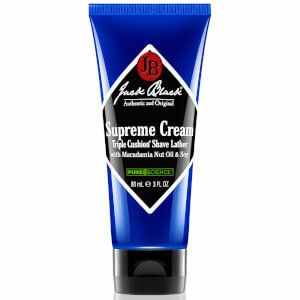 Work a small amount of product into slightly damp hair. Water (Aqua), Glycerin*, PVP, Propylene Glycol, Helianthus Annuus (Sunflower) Seed Oil*, Helianthus Annuus (Sunflower) Seed Extract, Hydrolyzed Lupin Protein, Hydrolyzed Rice Protein, Citrus Paradisi (Grapefruit) Oil, Organic Grapefruit Extract*, Zingiber Officinale (Ginger) Root Extract, Lavandula Angustifolia (Lavender) Oil, Macrocystis Pyrifera (Kelp) Extract*, Melaleuca Alternifolia (Tea Tree) Leaf Oil, Ocimum Basilicum (Basil) Extract*, Salvia Officinalis (Sage) Oil, Serenoa Serrulata Fruit Extract, Rheum Palmatum Root Extract, Acrylates/C10-30, Alkyl Acrylate Crosspolymer, Aminomethyl Propanol, Benzophenone-4, Butylene Glycol, Calcium Pantothenate, Disodium EDTA, Gluconolactone, Hydroxyethylcellulose, PEG-40 Hydrogenated Castor Oil, PPG-26-Buteth-26 Propanediol, Sodium Benzoate, Wine Extract, Ethylhexylglycerin, Phenoxyethanol *Certified Organic.